Last week I had an opportunity to spend a day in Hiroshima, where I had an opportunity to visit the Hiroshima Peace Memorial Museum. As I reflected on how the museum curators put together such a moving and powerful experience, it made me wonder what transferable lessons there could be for anyone who wants to make a presentation designed to move their audience to action. Entering the museum, we had an opportunity to learn about the history of Hiroshima. It was interesting. And awful. But I already knew much of this history (at least the World War II stuff). If the museum had stopped here, I don’t know that I would have been as moved or reflective when I walked back onto the street. Once we arrived in the main building, we entered a completely different atmosphere. I’m not sure I’d ever been in a museum that was as crowded yet as quiet as this. Stories of survivors. Tattered and burned clothes of children who did not survive. Exhibits and images that showed the effects of radiation on the body. This was no longer some awful yet abstract moment in the history of the world. It was real. It was powerful. It made me think of one of my father’s favorite sayings: “there but for the grace of God go I.” Even as visitors, we could imagine what it was like to be in Hiroshima on August 6, 1945. Before we left the museum, there was an opportunity to sign a petition for a worldwide convention on nuclear weapons. I observed many people signing their names. 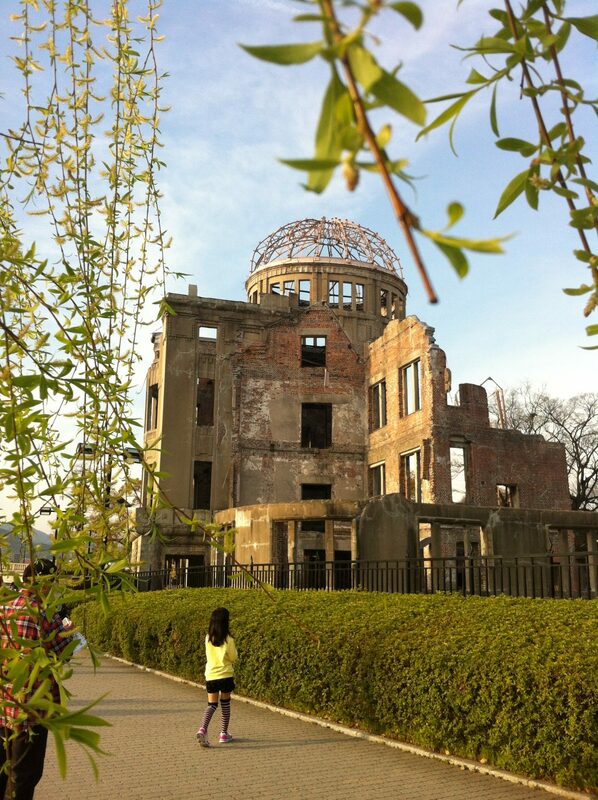 Outside of the Peace Museum is a large park with greenery, an eternal flame, several monuments and the Atomic Bomb Dome (pictured above, it was one of the only structures remaining once The Bomb exploded). After going through such a powerful experience, I was grateful for the time and space I had to reflect on what I had just seen and learned. Anyone who has read Switch by Chip and Dan Heath will recognize the first three elements from above: addressing the rational side of things, speaking to the heart and “shaping the path” (the call to action). These are the Heath brothers’ three essential elements of change management. The Peace Museum in Hiroshima was exhibit A of how these three elements can combine to create a powerful and moving experience. Having time and space to reflect and being able to process the experience by talking with my wife enabled me to more fully absorb what I had seen and learned. She talked about things she saw that I must have missed. She talked about things going through her mind that I hadn’t thought about. The thing I find most boring about a lot of museums is the same thing I find most boring about so many presentations and training sessions and new hire orientation modules: they only speak to the rational side of a topic. By tapping into the emotional side as well as the rational side and having time and space to reflect, the Peace Museum was an experience that will stick with me for a long, long time. If only we could say the same about all the presentations and training sessions and new hire orientation modules we have to sit through. The next time you get in front of an audience, what will you do in order to tap into both the rational and emotional side of your audience? Will you allow them time and space to reflect on and process what you’ve presented?